Cranberry Garlands, Let the Cranberries Go to the Birds! Save up to 22% on the perfect gift for everyone on your year-long list! Have Fun Making a Treat For Your Feathered Friends! Make cranberry garlands for the birds. Decide what you want to include in your garlands. Then you can choose what other foods you want to include. Maybe grapes, orange slices, raisins, popcorn, or peanuts in the shell. Find a needle and heavy thread--or you can use fishing line. Tie a knot at the end of the thread to keep any food from falling off. Decide on a pattern. 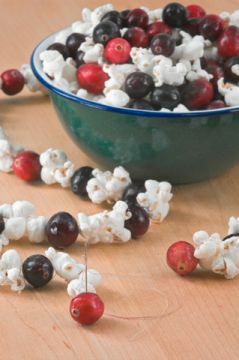 Maybe you want six cranberries, 6 peanuts, then a foot of popcorn. Or any other pattern. Carefully string cranberries and other chosen foods, repeating the pattern until you have pieces that are 3 or 4 feet in length. Tie another knot at the end. Drape on outside trees or shrubs. Hint: Stale popcorn strings better than fresh! So pop the corn a few days in advance of the garland-making day. You may even need to hide it so nobody eats it before the birds!